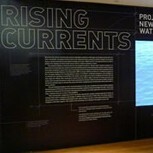 Now on view at the Museum of Modern Art is Rising Currents, an exhibition featuring work by several faculty members from the School of Constructed Environments at Parsons. 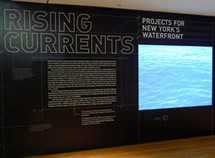 The work is the culmination of an eight-month project where multi-disciplinary teams were tapped to create solutions to New York Harbor’s rising water levels, and to protect endangered ecosystems. The future of New York’s waterfront has been identified as one of the most urgent challenges the city faces with the anticipated rise in sea levels due to climate change. Of the five teams of architects, engineers, and landscape designers, Parsons faculty members David Lewis of LTL Architects, Eric Bunge of nArchitects, and Matthew Baird of Matthew Baird Architects led three of the teams. The installation includes a wide array or models, drawings, and analytical materials. For more information, visit the MoMA website.